Contact form is essential on every blog or website because you can’t share your email ID on that. Different contact forms for different purposes may require and that should send you the data in your mailbox as the format you want. 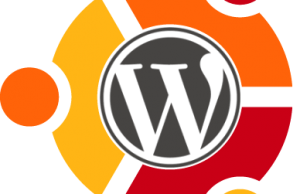 WordPress users don’t have to know to code a logical PHP for getting this done for their blog, they have the privilege of plugins to get this done in fraction of time. 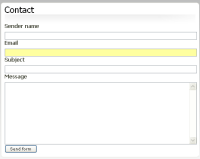 WordPress plugin “WP-Contact Form 7” can be used to get different contact forms for your blog. 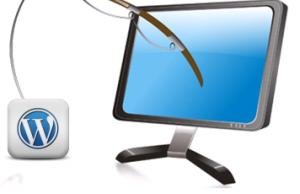 This is one of the best plugin for WordPress users because of the features provided here. 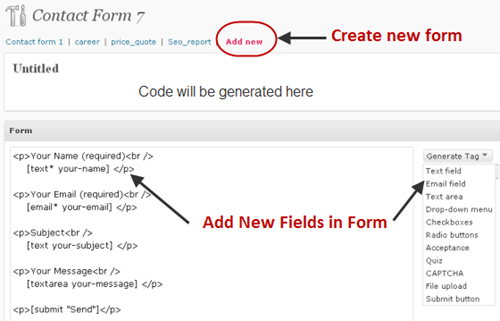 You can customize the form in such a way that you will get selected fields in your mailbox. You can also add CAPTCHA in this form by adding “Really Simple CAPTCHA” plugin along with Contact Form 7. You can create forms in Contact Form 7 thru a single click and then customize he form as pr your choice. Here is a form created thru Wp Contact Form 7 where for a support option. You need to put your email ID where you want the form data to receive. You can mention more than one ID and also change the format of the Subject Line. For example, if I am creating a form for support operation, I will add a term “Support” before the subject line so that I can identify hat this form data came thru Support page. 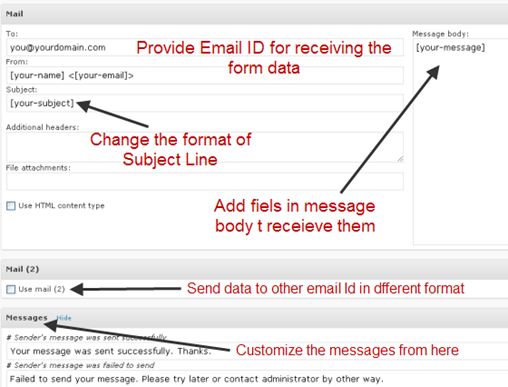 You can also customize the messages which appears after the completion of the form by visitor. Change the message “Form successfully submitted. Thanks” to “Thanks for contacting us, We will reply you ASAP”. This way you can put as many forms as you want and direct those forms to different IDs. I am using this plugin on other blog for a long time and didn’t find any issues related to that. We have already discussed “How to build a Contact form using Google Docs” which can be helpful when you need to insert a contact form on other websites.